After finishing my sleeves and hands I realized I hit a true creative roadblock figuring something out for my knuckles. I wanted to avoid most of what I had seen on other people because either it did not represent me or it just seemed way too cliche. I work as a year round employee of Netherworld Haunted House in Atlanta, GA doing everything from special effects to set design. 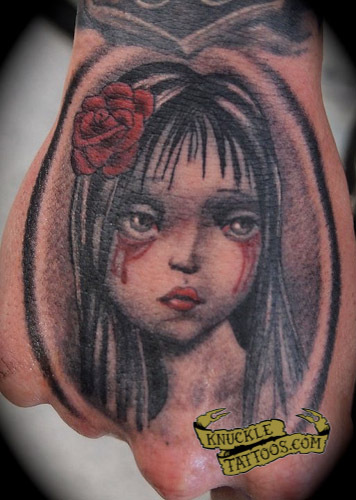 Obviously I am a big fan of Halloween and horror in general and much of my tattoo work represents that world. One day I am working on an animated creature with music blasting as normal and suddenly The Misfits “Horror Business” begins to play. For whatever reason I stopped working and looked at my hands realizing I had just found the missing link in my knuckle tattoo design. 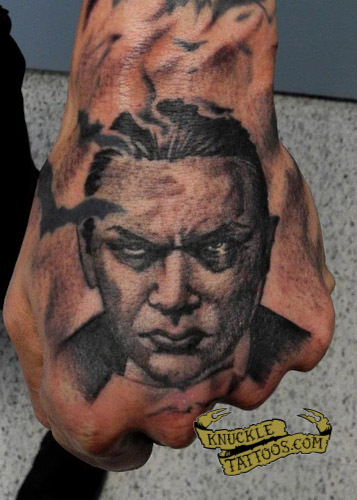 Sent the idea over to my friend and tattoo artist – Lew Hands @ Timeless Tattoo to see what he thought. 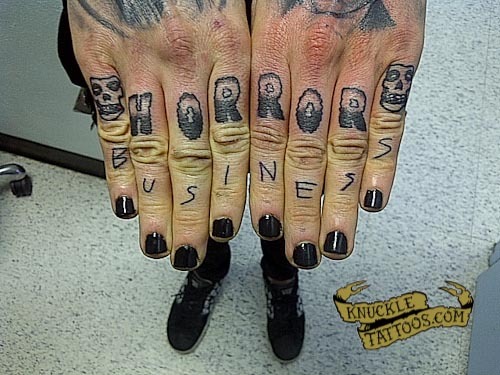 There was some hesitation doing “HORROR BUSINESS” because while my hands are together the design works but each hand individually makes no sense. I pretty much persisted and was dead set on the idea being a huge Misfits fan as well as representing what I do for a living and am most passionate about. Lew put his artistic touches on everything and suffice to say we are both stoked on the results of the tattoo. Attached are both hands and my knuckle tattoos – all done by Lew Hands @ Timeless Tattoo in Atlanta, GA.